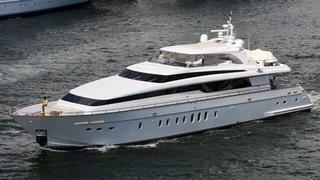 Sanlorenzo of the Americas have announced the sale of the Sanlorenzo SL108 motor yacht designated 108-488. Randy Coleman represented Sanlorenzo and Steve Fill at Bradford Marine Yacht Sales introduced the buyer. Launched in late 2008, this 32.8m superyacht is perhaps best described as a "demonstration model" having been used by Sanlorenzo to promote the Americas Edition of their 108 series at various yacht shows. Indeed it was at this year's Miami Yacht & Brokerage Show that the buyer fell in love with her. Negotiations started there and then, and the deal eventually closed on April 29. The asking price was $9.9 million. Recently delivered to her new owner who has been adding his own personal touches, Randy says that she is currently lying in Fort Lauderdale with her new name – Japimana – proudly displayed. After an extensive cruise through the islands she will head to her new home on the West Coast of Mexico.